Stigma is defined as “a mark of disgrace associated with a particular circumstance, quality, or person.” You could also say stigma is a negative stereotype or attitude. Many people feel that way about those with a mental health condition. Unfortunately, for all of us this attitude or “judgement” about something or someone is quite common. This belief usually comes from lack of information. Dementia due to substance abuse, inhalants, drugs, and alcohol abuse is also considered a mental health disorder. 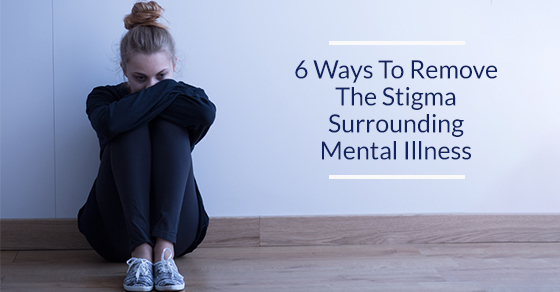 It’s safe to say many of us know someone with at least one of these mental health problems. So why is there so much stigma still attached to them and their condition? The most damaging result of this stigma is that those who suffer from a mental health disorder begin to think they are to blame or are not worthy of help, or feel ashamed. If you are involved in eldercare, you are aware that they may not seek the help they need. How Do We Help to Remove the Stigma? Educate yourself about each disorder. Once you know the truth, you can share it with others. If you see or hear family, friends, or even the media provide incorrect information, challenge them. Explain how this just perpetuates wrong information and stereotypes. Words are important. Choose them carefully when referring to or speaking with someone who has a mental health issue. It’s hard to grow up without picking up prejudices from our families. Be well aware of those thoughts and proactively change them. Look at mental health patients as whole people, not just as their illness. By your example you may help others see that there should be no stigma attached to someone with a mental health disorder. Treat everyone with the same respect. Encourage a friend or co-worker with a mental health issue to seek help with their problems. A depressed friend cannot just “snap out of it.” They need professional help and need to be encouraged to get it. Don’t allow them to feel ashamed about their illness or doubt themselves. Social media is used for all kinds of negative pursuits. This is a perfect opportunity to make a positive contribution. Send out a weekly Facebook post or tweet with a positive message or point out a myth about mental disorders. When you need professional help in caring for someone with a mental health disorder, trust in the compassionate and knowledgeable caregivers at C-Care Health Services. I hate the Stigma about Mental Health and battle with Major Depression.